This topic contains advice specifically directed toward Sangha (monks and nuns), and includes subjects of interest to both Sangha and lay practitioners. 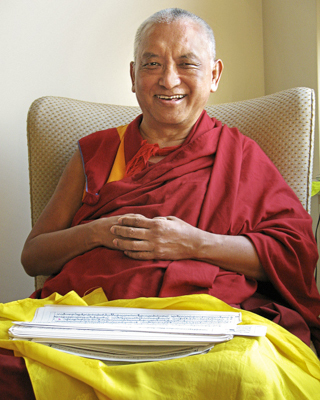 Rinpoche offers extensive advice on the benefits of ordination and emphasizes that the Sangha are the best champions, because they are fighting the delusions. He advises Sangha how to deal with negative emotions and how to wear robes correctly and neatly. Rinpoche also advises Sangha about specific daily practices and meditations, and offers advice to students requesting ordination, as well as to Sangha wishing to disrobe and give up their vows. See also Advice for Monks and Nuns, a collection of talks by Lama Yeshe and Lama Zopa Rinpoche on the benefits of practicing Dharma as an ordained person. Read this book online or download it as a pdf file or ebook; see our online store for details. Read more in Vows and Commitments, which contains further advice from Lama Zopa Rinpoche about taking vows and about broken vows and commitments. For more information and resources on ordination, see FPMT's How to Become a Monk or a Nun: Preparing for Ordination and the International Mahayana Institute (IMI) website.